The news that Rachel Johnson, the last person to have lived on the island archipelago of St Kilda, forty miles west of the Hebrides and perhaps the remotest group of islands in the British isles, has recently died at the age of 93 gave me much food for thought regarding the situation relating to remote settlements in Italy. St Kilda consists of four islands, Hirta, Dun, Soay and Boreray and is one of the most spectacular and beautiful places in Scotland. We were privileged to have been selected by the Scottish National Trust as part of an archaeological work party to the islands in 1988. I’d wanted to visit these islands for a long time, being very much an ‘island’ collector and the only way to get there was to join a work party. The islands exerted their special magic on us. They have the tallest cliffs in Britain and the fulmars flying below us seemed like candy floss. 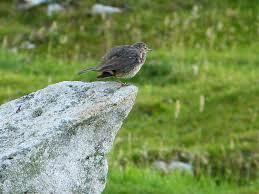 The sheep were of a wild, ancient variety and our first sighting of the unique St Kilda wren was truly special. Bonxies (skuas) would hit us on the head with their claws if we approached their breeding ground and one night, in particular was especially enchanted – it was the night we spent on the cliffs with the storm petrels returning with their eerie songs to their underground burrows . Puffins were our friends so were the gannets and many other sea birds. 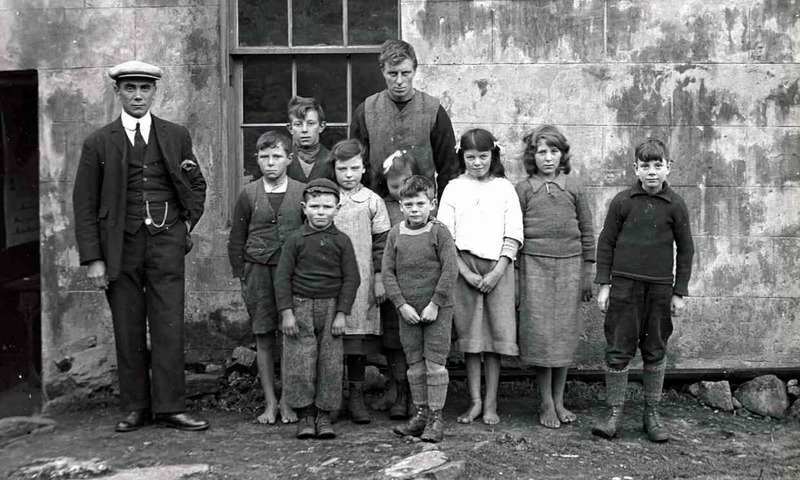 Now there is no one left to remember what it was like to live in St Kilda before the evacuation of its population in 1930 when Rachel Johnson was eight years old and life had become quite unsustainable because of a decreasing population. The sad human emptiness of St Kilda reminds me of the many Italian villages which have been abandoned with perhaps just a few old people to reflect on the past social life of the place they were born in. 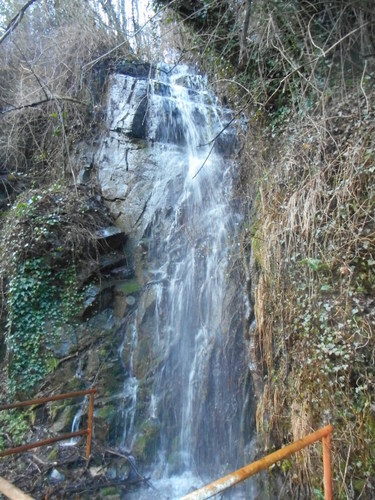 In our own area we have several abandoned villages, the most notable of which is Bugnano. But there are plenty more to re-discover. As for the settlements of the summer alpeggi there are even more to consider. If only stones could speak! Longoio itself is diminishing in size as more and more people leave for towns and cities in search of work. I am probably one of a handful of people who live here the whole year round. At Easter and in the summer holiday cottage owners arrive (though not always). For me they appear to resemble passing migrating birds who have no real connection with the place they visit. Frankly, I have little to do with them and some of them are (unfortunately) downright ghastly concoctions who appear to spend most of their time on the booze and round the barbie. The times when people would work hard to make a living from the soil have largely disappeared from Longoio as they did in 1930 for St Kilda. That’s why when I see a young shepherdess who has returned to the land with her flock or when I meet someone who has consciously left the city to seek life in a shelter among the woods my heart truly leaps for joy. Ten years after leaving St Kilda I wrote this. of fire the rocks exalt a limitless moan. that such conflicting elements can be. our inmost fears and admits no pity. and seals dip through the primordial strife. to wind-thrown cleits, cyclops’ walls and sedged graves. and all around the sombre sea sulks. I hope I shall never have to write a similar farewell to Longoio…..
Flip and Flop are doing well and it is wonderful that they are still with us since ducks are particularly prone to finish up in Mr Fox’s belly and we are almost completely surrounded by forests where he and his cunning ilk live. Our ducks are Muscovy ducks which originate in Guatemala and can still be found there in their wild state along the Rainforest Rivers. Flip and Flop are two females. We did have a male but after a couple of maternity explosions with over forty ducklings and after the sadness of seeing Mr Bianco, our great male (weight over 6 kilos) beheaded by that insatiable Mr Fox we decided to keep the remaining females just for their eggs. Muscovy ducks (so called because they were first traded by merchants from Moscow – rather like Turkeys were first traded by merchants from Turkey) have long talons, caruncles round their beaks, a little crest, and a very sharp peck so they have a certain ability to defend themselves. They can also fly, although after a pioneering flight by Flip across Longoio to the car park, I decided that they should have one of their wings slightly tailored so that if they took off they’d behave a little like a boomerang and come back to their starting point. Flip and Flop’s brains are natural marvels of biological technology far surpassing in miniaturisation and complexity anything dreamt up by computer scientists. I love my ducks and am ever more impressed by their intelligence and friendliness. 1. 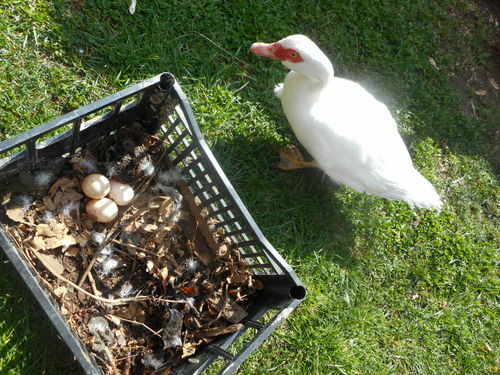 Ducks lay eggs throughout the year and what eggs! You can tell a cake made from duck eggs from one made with hens’ any day. They are much more delicious! 2. Ducks are far less prone to disease than chicken. 3. Ducks can be trained more easily to obey commands and they can even accompany you on trips though I wouldn’t suggest this around here because of the danger of dogs as well as foxes. 4. Ducks, as all other avians, are the missing link between dinosaurs and mammals. They are, thus, an incredibly interesting species to study. 5. Muscovy ducks don’t need too much water and are quite happy to splash about in our garden pond (unlike other ducks which spend a lot more time in rivers and lakes). 6. Muscovy ducks love feeding on grass and are able to keep it short and fertilise it at the same time. 7. Ducks are so happy when it rains that they are able to transmit their joy to you so that you don’t mind too much when it does pour (or even snow!). 8. Ducks are very inquisitive when you start digging in the garden with a trowel to plant something. They sniff over every bit of earth that you turn over, in search for that elusive worm. 9. My ducks are great connoisseurs of snails which they eat raw thus helping lettuces and cabbages grow with less holes in them. 10. My ducks are very quiet. In fact, in Italy they are called ‘mute ducks’ (oche mute). Males are completely silent but the females make endearing soft whistling noises to each other rather like a contemporary music piccolo duet. I think that if I kept geese or other types of ducks I’d go quackers with the noise, not to mention the neighbours! My ducks have also acquired a taste for cat biscuits and I have to make sure the front door is closed as they will otherwise rush in and help themselves from the cats’ feeding bowls and there’s no question about whose top of the pecking order then! and enjoy the water’s cool spray. we know, and to that we are quite wise! for you are good and kind and true. PS Our ducks are called Flip and Flop because they make a noise like wearing flip-flops when they walk about on paths. Yesterday’s afternoon cleared up briskly to reveal not only blue skies but the first substantial snowfall on the Prato Fiorito which is 4625 feet high and just behind us. Crossing the bridge at Borgo a Mozzano revealed the main Apennine ridge, which is around 6000 feet high, covered with snow. The effect at sunset when the snow turned into a rosy hue was so beautiful. As happened with perhaps the coldest winter in living memory in the UK, that of 1946-7 when temperatures dropped below minus 20 degree centigrade, things only really started to get cold at the end of January. We are in the thick of “i giorni della merla”, the days of the blackbird, when the coldest part of winter hits us between the last week of January and the first week of February. 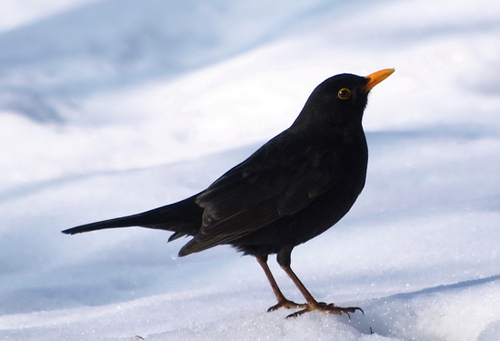 Strictly speaking, the days of the blackbird are the last three days in January. So the weather has been true to traditional prediction. There is a local legend about this which was told to me in Italian. As a fun thing to do I’ve turned the Italian prose into English verse! the winter had never been so cold. their little lives exposed, unconsoled. “we’ll nevermore see the spring again”. before they too were hidden by snow. Their feathered hearts were filled with iced-up dread. while a hard north wind began to blow. “We must decide now or die” the parents said. and keep warm next to that cosy spot”. kept by the stack which blew warmth and smoke. free all-day heating for avian folk! from their tails right up to their eye-lids. “No matter,” he said, “we’ll rename ourselves. thanks to that useful chimney-stack! The cormorant is one particular bird which unites Greenwich, London, where I used to live, with Bagni di Lucca where I reside now. At the old ferry pier, by the Thames Woolwich reach, cormorants habitually congregate in flocks and then weave their way just above river surface in search of their fishy prey. The river near Bagni di Lucca is the Serchio and, coming back from Penny market yesterday, I spotted what I would call “cormorants’ corner”. One might be forgiven for thinking that so much rain has fallen of late that even cormorants have to spread their wings out to dry them but the real reason is that these birds lack essential water-repellent oils that other birds have, and their plumage, therefore, needs a spot of help from the sun and the wind. This is because cormorants are a very old species of bird and rather closer to the dinosaurs from which they are descended that any other avian variety. The following poem of mine suggests this fact and also several other attributes of this fascinating bird. 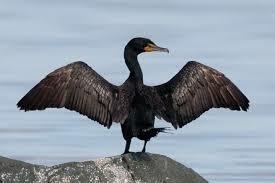 For example, the particular stance of a cormorant in drying its wings alludes to Christ on the Cross. Furthermore, cormorants have even used for fishing by the Chinese and Japanese with a collar round their necks to prevent them from swallowing their catch. PS By the way, no marks for guessing from which bard the title of this post is taken. of strange omens you bring. from crags where you are king? while white fish bones you fling. There are many ways of getting to and from Longoio and Florence. The fastest (and most boring) way is to take the autostrada del mare to Lucca or Altopascio and just drive straight there. More interesting is to choose the road through the Controneria to la Lima and then drive through San Marcello Pistoiese until one descends into Pistoia (another great town well worth a visit) and then take the short stretch of motorway that leads into Florence. This is definitely the most scenic road to take: the view from Le Piastre is especially stunning. A route which is quite fast but involves no motorway tolls is that which takes one to Altopascio and then goes across the Arno valley through Galleno and Fucecchio to hit the Fi-Pi-Li superstrada at San Miniato del Tedesco. It was this last route that I took returning from Florence. Despite some crass industrialization and cement pouring over large tracts of the Arno valley this route has many beautiful parts. Indeed, it has the largest wet-land area in the whole of Italy – the Padule di Fucecchio – which are the equal of any fenland area or even Slimbridge in the UK. I’ve visited this area before and will say the best time to see its fauna and flora is before June when the birds start migrating. The destruction refers to the times the bridge was involved in the battles between the Florentines and the Pisans. Interestingly, Leonardo da Vinci refers to the bridge in one of his drawings which shows the fortified bridge and its tower. Anyway, there was no sign of revolting Pisan forces when I approached the bridge upon my return to the old Luccan republic. Instead, there was collection of stalls beside it dedicated to natural history as part of a local event and with many interesting things to look at or even buy. One stalls holder is a retired physics and chemistry teacher and a keen geologist. I purchased a shark’s tooth of the Cretaceous period from him, rather larger than the ones I’d been used to digging up in the Blackheath beds of Lesnes Abbey woods in south-east London and had a most interesting chat with him at the end of which he presented me with a piece of meteorite which was most magnetically attracted (and attractive). The birds of prey on show were most impressive. The owls, including the eagle owl and the barn owl (which in Italy is called “barbagianni”) were also very noble. 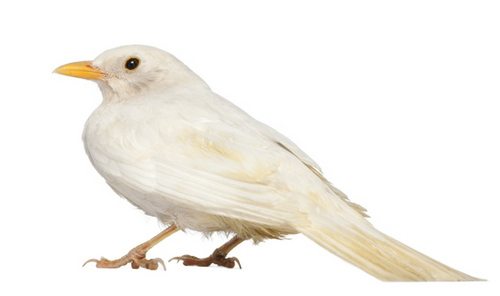 These birds come from a nearby wild-life sanctuary. Less attractive were some of the cockroaches and other beetles but the examples of butterflies and moths were gorgeous. The praying mantis and other live insects showed off their camouflage to perfection. To top it all there was a dray horse from France, a Percheron, who was getting ready to take children for a ride on this carriage. If I stopped at every place or event of interest I encounter on my way to and from Florence I’d never get home! There is so much to see and do all the year round.